Say 'no' to cars. This is the ultimate verdict from people now fighting hard to reduce the dependency on automobiles. An idea that seemed utopian in the early 1990s is now firing the imagination of many more across the continent. Car-free cities are poised to chase dream cars out from crowded city centres. There are no car-free cities yet. But there are quite a few car-free housing development schemes in different European cities and stronger policies to promote cycling and walking in other parts of cities as well. These schemes encourage people to reduce car dependency and move towards housing developments which give priority to pedestrians, reduce pollution, potentially lower the cost of housing, provide a quiet environment and alternative mode of transport. Initially, the idea of the car-free city centres emerged as a very loose concept in the 1960s and 1970s. The focus then was to reduce traffic in busy shopping malls and business centres. Over time it assumed a concrete shape, meaning and perception. During 1990s, an increasing number of local initiatives in the United Kingdom and Germany provided opportunities to European citizens to think about more ecofriendly urban mobility. These initiatives got good popular support. Soon, as a symbolic gesture, September 22 was declared car-free day. The car-free day concept is not merely of limiting traffic in certain streets but of enabling city dwellers to discover other means of transport. More than 150 cities worldwide observed car-free day on September 22, 2000 as a symbolic gesture to ensure mobility without compromising on the quality of life. Each year on the same date, the European cities participate in events that reserve an area for pedestrians, bikes, clean vehicles operating on lpg and natural gas, electric vehicles and public transport. But this concept has been so strong that now many cities around the world have begun observing car-free day every year. Originally, a European concept, many other countries have caught the idea and implemented it. "This is a reaction that is slowly setting in as cars and more cars are choking cities and leaving citizens breathless. From Bangkok to Los Angeles, from Berlin to Capetown, urban planning for the last few decades has been determined by mass motorisation," says Heiner Monheim, expert for transport policy at the University of Trier, Germany. Obsessive focus has been put on increasing the number of automobiles, widening roads, making flyovers, tunnels and highways, and turning open spaces into parking lots. However, increasing traffic from trucks and private cars creates related problems of congestion, pollution, noise and the emission of greenhouse gases. Follow-up costs for maintenance, health or environmental damages are staggering. Public transport has been neglected, increasing the need for private cars. As a result, pedestrians and cyclists are pushed aside. Many of the cities in usa and its suburbs are among the world's most pedestrian-hostile environments. In fact, 50 per cent and 70 per cent of us downtown space is allotted to traffic lanes, parking lots, garages, gas stations and car dealerships. Worse still, in Berlin, cars take 50 times as much space as do playgrounds for children. The car-free day provides an opportunity for the municipalities or urban areas to test new measures or new developments in terms of urban mobility, for example, delivery systems using clean vehicles, a new route of public transport, car sharing in companies and bike-parking areas. The concept aims to promote public awareness to influence commuter behaviour that is compatible with the improved urban mobility and protection of environment. It seeks to raise awareness with respect to the thoughtless use of cars in towns and to reaffirm a place for pedestrians, cyclists and public urban transport. A major initiative came from the French Ministry of Land Planning and Environment. It launched a nationwide operation in 1998. About 35 French towns responded and organised 'In town, without my car' day on September 22, 1998. A year later, a total of 66 French towns (almost twice as many as in 1998) and also 92 Italian towns and the canton of Geneva participated in the first European 'In town, without my car' day. All these towns banned vehicular traffic in certain areas where only public transport, cleaner vehicles, bikes and of course pedestrians were allowed. In Italy, an overwhelming majority of the city population used public transport or travelled on foot or bike. The average number of people using the transport network also increased by an average 10 per cent on that day. Some cities even registered increases up to 900 per cent more cyclists. 'In town without my car' has become an organised movement today, thanks to the official support of the European national governments and the European Union. As these initiatives are in line with priorities of urban transport and sustainable policy for towns of the European Union, the European Commission and the Directorate General for Environment have decided to provide political and financial support for organising a car-free day in Europe. The entire programme is aimed at promoting voluntary efforts but each city is free to choose locally-appropriate systems. With the political and financial support of the European Commission, many partners have gathered to form the current life project team that will contribute to national initiatives. These include the French Ministry of Land Planning and Environment, the Italian Ministry of Environment, the French Environment and Energy Management Agency, the Italian Agency for the Environment, New Technology and Energy Management, Climate Alliance of European Cities and Car-Free Cities Network. Some 60 European towns have joined the Car-Free Cities Network, since it was launched in 1994. The network is committed to develop and implement technologies and management methods for traffic volume reduction in cities by encouraging the use of more environment friendly modes of transport. Moreover, mayors of different towns sign an undertaking that states, "in order to ensure the success and common European nature of the event we undertake to plan our actions in accordance with guidelines..."
The success of this initiative involves mobilisation of as many countries and towns as possible and also requires common tools for implementation. Members of the European Union will have to play a role and guarantee consistency of the political message, develop common methods and organise dissemination activities in each town and city. At the local level, stakeholders like the shopkeepers, companies, associations, schools, will mobilise people. All these initiatives aim at promoting greater mobility and at the same time promote better quality of life. Interestingly, the concept has generated a lot of political interest too. On the car-free day, several members of the European Commission including environment commissioner Margot Wallstrom cycled to Cinquantenaire Park in Brussels to celebrate car-free day. 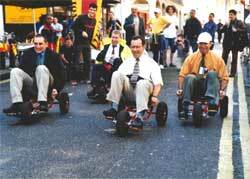 Wallstrom launched the car-free day in 2000 to bring together national ministries and energy agencies, networks of local authorities, non-governmental organisations and the European Commission (see box: Going into overdrive ). The concept has also caught the imagination of the developing countries. Residents of Bogota, Columbia went for bicycles and boarded buses and walked down to get to work on the car-free day observed on February 24, 2000. To raise public awareness, the streets of Bogota were closed to personal motor vehicles from 6.30 am to 7.30 pm on the car-free day. Nearly 400 km of streets, alleys and other pathways were strictly reserved for bicycles and pedestrians. On this occasion, the Bogota mayor, Enrique Penalosa Londono, said, "The goal should be for Bogota to make a collective decision to ensure by first of January, 2015 three rush hours in the morning and three rush hours in the afternoon, without private cars. Everyone should move in public transport and bicycles." Quite surprisingly, in Bogota, only 14 per cent of the city's residents own a car. Yet it takes more than an hour to travel 10 km during peak traffic. The car-free city concept evoked support of 65 per cent of the Bogota population. Experiments with car-free city centres have gone much beyond the symbolic celebration of car-free day once a year. Such initiatives have helped to kick start major changes in urban planning in many European cities. In March 1994, the conference on car-free cities was held in Amsterdam with representation from 21 European countries when the concept of car-free cities was integrated with the Urban Environment Unit of the European Commission. l Temporary restrictions on driving, such as during pollution emergency days and so on. These concepts are implemented largely through municipal planning efforts or as part of project development like housing complex. Car-free planning has been largely integrated with housing development schemes in some European cities as of now. The basic idea of the concept of car-free housing is simple: People without a car should be offered a surrounding where they benefit from the absence of cars. Car-free initiatives can be very effective in European countries where about 80 per cent of Europeans live in cities and 30 per cent of car journeys in the 15-member European Union involve distances of less than three kilometres. The very first proposal for a car-free housing scheme was the settlement of Hollerland near Bremen in Northern Germany. The proposal was initiated in 1992 in cooperation with the municipal building association, the department of environmental protection and urban development and the department of building of the city of Bremen. It was preceded by an experiment wherein six families, all with little children, volunteered to refrain from car use for a period of six weeks. "The results showed that none of the family felt restricted in mobility," recollects Michael Glotz-Richter, head of the section for ecological urban design at the department for environment protection and urban development and one of the initiators of the Hollerland project. They either changed their behaviour by shopping in the neighbourhood, or chose other activities like bicycle tours instead of car trips, thus leading to a new and different lifestyle. All of them recalled new experiences while travelling in a bus or a tram and a different perception of the environment, making up for longer journeys. After the experiment, five of the six families sold their car. "The concept of car-free housing is radical," says transport policy expert Monheim, "as it breaks away from the prevailing principle of transport policy and urban planning that people may buy as many cars as they want while the community will take care of sufficient space to park or drive." The first and immediate advantage, of housing geared especially towards non-car owning residents, is costs. Because of less roads and parking lots, development costs can be lowered by up to 10 per cent per unit. The second advantage is more space for lawns, gardens or playing grounds. In Hollerland, for instance, only 17 per cent of the area was earmarked for roads and parking space compared to 40 per cent in a conventional housing project. One of the main obstacles to car-free housing is a regulation which requires developers to supply parking facilities with each project, normally one lot per residential unit. A sufficient supply of car parks as close as possible to the house is considered to be a precondition to market a housing project and to avoid a burden on the neighbourhood by increased parking pressure. To scrap this provision, interested parties in the Hollerland scheme had to give a binding declaration never to buy a car. But there is scepticism over such a "life-long" declarations of living without a car. Its legal status is questionable too. To address this concern, more flexible mechanisms like those in Vauban have been developed. In some states like North Rhine Westfalia (the area in which Bonn is located) or Berlin, the provision was scrapped altogether or relaxed. Hollerland never got off the ground. Despite a lot of initial interest, the offer of the first units did not get the expected demand due to a recession in the housing industry. But the project challenged the traditional car-friendly planning requirements. It also stimulated a new integrated and more participatory planning approach. The project also inspired many similar initiatives and projects all over Western Europe. In Bremen itself, a car-free housing project was realised in an inner-city area, although on a much smaller scale. There are other similar schemes in Germany like in Hamburg, Tbingen, Munich and Freiburg, as well as in Amsterdam, in Edinburgh and in Vienna. Most of them combine various ecological and social features making them into models of a new sustainable livelihood. One of the earliest and largest car-free housing projects so far is the gwl -Terrein in Amsterdam with around 600 residential units, some offices and small enterprises, situated close to the city centre, the railway station and shopping areas. When the project was completed in 1998, all flats were already sold or rented. Many residents moved into the gwl -Terrein because of the bigger size of the flats and the proximity to the city centre. But one third gave the car-free concept as a decisive reason. About 57 per cent of the households, surveyed in 2000 by the Australian-based Institute for Sustainability and Technology Policy ( istp ), live practically car-free and 62 per cent do not own a car. Both figures are significantly higher than the average. Unlike the gwl -Terrein, which was planned and executed by the local council, Quartier Vauban was planned and implemented with a lot of participation from residents' and citizens' groups, organised in the Forum Vauban. Most houses in Quartier Vauban were built by co-operatives and small groups of individual owners, according to their ideas and wishes. The houses are especially built with wood to reduce energy, most of them have solar panels on their roofs and a common garage building. The planners expect that in shops, offices and small manufacturing or service companies, around 600 jobs will be created thereby reducing the need for residents to commute further. "Compared to conventional housing projects, car-free housing poses several challenges for municipalities and planners. City planning is mainly done by persons aged between 30 and 50, who are traditionally more oriented towards cars," explains Esther-Maria Dellmann from the Car-Free Living Association in Berlin. Moreover, most municipalities are not used to an integrated planning, considering long-term benefits too. And shifting planning priorities and funds towards other forms of mobility like public transport is often difficult because of vested interests or public opinion. "Besides, without the push from organised citizens' groups, hardly any project so far would have been realised," observes Willi Loose from the Institute for Applied Ecology/ ko-Institute in Freiburg, Germany. And for the success, participation of people in planning and implementation is essential, because it generates a lot of enthusiasm, ideas and commitment. To allow for such participation, in Freiburg, the city's Building Department formed a separate task force, co-ordinating planners, councillors, developers, architects, residents and citizens' initiatives. "Regular meetings and dialogues created an atmosphere of cooperation, mutual trust and learning and gave future residents a say in the design of their houses and their environment," informs Loose. Roland Veith, in charge of the project in the Building Department of Freiburg, is full of praise for the cooperation with citizens' groups and initiatives. "There have been conflicts," he admits, "but overall it has been a unique process of 'learning planning', making the implementation much smoother, faster and better." Veith proudly says that mayors from as far as South Korea come to visit Vauban. An important precondition for the success is an efficient and fast public transport system. Transport policy expert Heiner Monheim envisages a modern mobility management system by systematically and efficiently combining a variety of mobility services like car sharing, an infrastructure for biking and walking, and public transport. With such a system in place, living without a car can be much cheaper even than owning a car. Slowly, the idea of car-free living is picking up speed. Currently there are nearly 24 projects in Germany realised or in the pipeline, and several more in Europe. Observers feel that the market potential is far from exhausted. Some estimate it as high as 10 per cent to 15 per cent of all new housing projects. Market research done in Edinburgh shows that there is significant demand for housing on this basis. Markus Heller, a young architect in Berlin, is also confident, that the concept of car-free living is a marketing success. When the municipality failed to attract commercial developers for a conventional housing project right in the heart of the German capital, he was asked by a group of environment organisations and citizens groups to draw up a plan for a block with 600 flats, spaces for shops and services, cultural and social infrastructure, sports grounds and parks, completely free from motor traffic. One of the most interesting features of this car-free development will be the inclusion of a city farm, which will serve as an ecological service transforming organic waste into fresh fruit and tasty vegetables. It will also include a community centre and shops. The farm will provide plenty of leisure facilities for children. "In the sluggish housing market of Berlin, car-free projects with their benefits not to be found easily on other housing projects are attractive," Heller feels. "Initially we were regarded as crazy leftists," he recalls, "but now there are several potential investors." Many people who come into towns on car-free days are particularly amazed by the lack of stress and the improvement in air quality. French air quality monitors declared the results of the second national car-free day (September 22, 1999) as 'satisfactory' after only clean fuel cars and public transport in city centres were allowed. Figures show that in central Paris, levels of carbon monoxide fell by 30 per cent while those of nitrogen dioxide dropped by 15 per cent. An opinion poll carried by the French environment ministry on September 22, 2000 showed strong public support. Over four-fifths of the respondents said the idea was a good one. One-fifth of respondents in participating towns claimed to have renounced their car for their daily trip to office and 44 per cent felt the car-free day should be a weekly event. Opinion surveys carried out in Italy and France show a high support with as many as 85 per cent approving such an initiative. A survey conducted in Dormund, Germany established that 75 per cent considered a car unnecessary for their mobility needs.